Hungry? In Oakland's Temescal district? Then you are lucky! BakeSale Betty's, Dona Tomas, Pizzaiola are all walking distance from each other. All amazing taste treats. But if you, like we BrixChicks, are in search of a great foodie experience that includes wine, you will LOVE the newest offering: Barlata Tapas bar, where you can try delicious Spanish wine by the glass or bottle, as well as snack on, okay, devour, yummalicious tapas. The decor is simple, but comfortable with saturated primary colors and lots of light from outside Telegraph avenue. Servers here are knowledgeable about what they serve and if not are happy to ask. Chef Daniel Olivella brings his successful ( he also owns B44 in SF) and lively pan-Spanish cuisine to the East Bay. We are so glad that he did. Everything we tried was delicious. 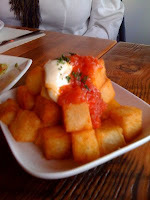 Patatas bravas came in a pyramid of crisp on the outside, mealy on the inside squares enlivened by a spicy pimenton and dabbed with rich aioli. Spanish tortilla was savory delight. And fideos with seafood were a tiny skillet full of perfectly prepared noodles rich and dark with the taste of infused seasonings and olive oil and studded with pieces of monkfish and tiny, purple calamari legs. Both so delicious they were gone before I could capture a picture. Small plates to meet a variety of tastes are available. Whole soft white anchovies, olives, oxtail, etc...And the wine? Off the hook. Many offerings by the glass and reasonable prices by the bottle. I could not resist my old friend Juan Gil and the delightful Monastrell with its inky, blackberry deliciousness. But we also discovered a new monastrell, this one a blend with Cabernet Sauvignon 02 Viña Ulises crianza, Alicante aromas of cedar and leather, with a dark red color and dry but pleasantly fruity cedary flavors, I found it a great discovery. On our last visit we managed to save room for dessert and shared a plate of sweet small bites. The pumpkin seed brittle went great with the wine. Items from all across Spain are here and wines to pair with them. We had several lively visits here and plan to return soon. Affordability - The problem is that everything is delicious, so a tendency to overorder can jack up to the final total. However, everything is so good, that you won't mind. Wine list - All Spanish, many regions are represented here and the QPR that comes from having someone find, source and serve items that you can look for later on your own is stellar. I look forward to trying something new there soon. Wait staff- Very attentive and knowledgeable. Excellent customer service is a hall mark here. Food- Amazing! 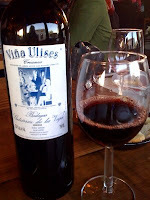 Catalan native Olivella brings many classic Spanish items from "Rioja to Jumilla" to the East Bay. In summary, come for the food, stay for the wine. You will so not be sorry you did!